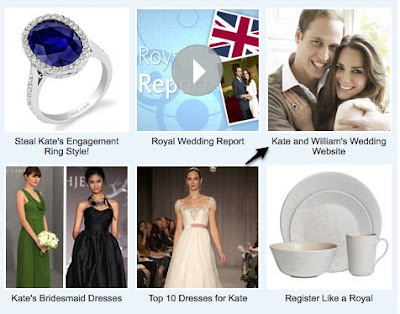 Recently while I was wandering around TheKnot I discovered an ENTIRE William/Kate section. Plus - they have a Royal Countdown ticker. 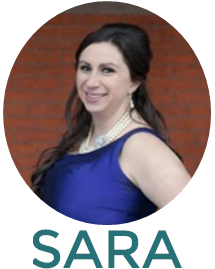 You can add yours to your blog or web site -- I added mine to my sidebar! 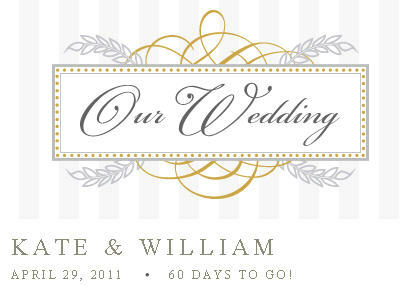 And lastly (and probably the most fun) they created (for fun) a wedding web site for William/Kate. Please note: the wedding web site was not created by or endorsed by the royal couple - the staff over at WeddingChannel.com wanted to do something fun for the rest of us. Filled with all the fun stuff that other couples provide for their guests...this is quite the awesome web site for us Royal Wedding obsessed. So do yourself a favor and check it out. PS the guest book is a REAL function. Leave a message...I know I will, well maybe.